My first piece completed for this last Spring's sculpture class was Reliq, a sort of curiosity cabinet slash reliquary presentation of objects imbued with a universal symbolic system. The total composition is presented in the image below. I will admit to these not being the best photographs of the piece, but as I learn more about digital imaging, I hope to better document Reliq. It is my overall intention with Reliq to address the cyclical nature of the life and death continuum, loss, accumulation of memory through the collection of objects, and the unfolding of symbolic meanings themselves. This piece, like Limnal(spring), also had at its core an interest in viewer led derivation of meaning. My practice, as it has developed recently, is not interested in forcing the materials, physical or conceptual, into anything which is inappropriate for them. I also do not, likewise, wish to force the perception of the audience into anything too specific. Interpretation is an open field for the receiver of a work of art. The audience deserves as much freedom as I do as an artist and the materials do as tools for communicating intent. 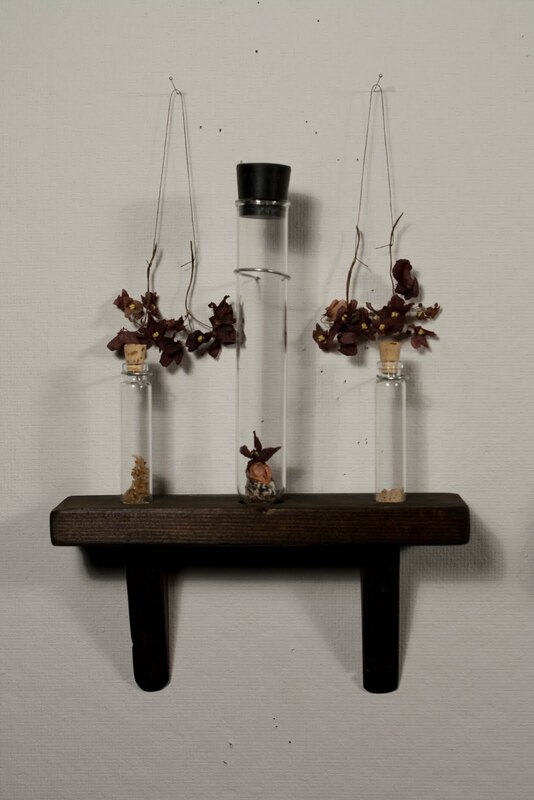 Reliq, by being an open, yet organised, succession of objects, allowed individualised audience elaboration upon the conceptual goals behind the piece, but the objects themselves, evocative and resonant, needed only to be presented in concert to reveal their associative meanings. There is also a great deal of personal significance to the various objects, which I will touch upon lightly, just because, along with the details following. 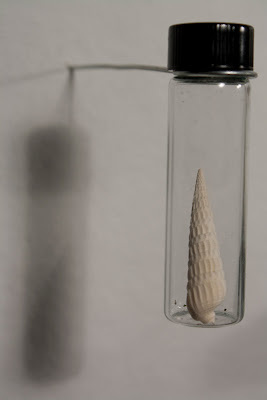 Spiral shell from Big Lagoon State Park, near Pensacola, Florida, collected Summer 1991. Glass bottle provided by JB, Omaha, NE, March 2010. 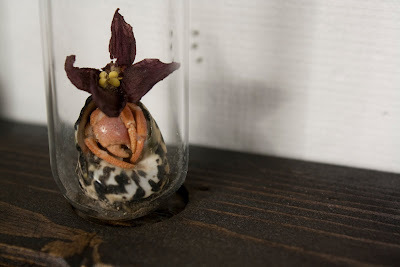 The hermit crab was kept by Natalie and myself, and was found dead when we had arrived home from a trip in June, 2007. 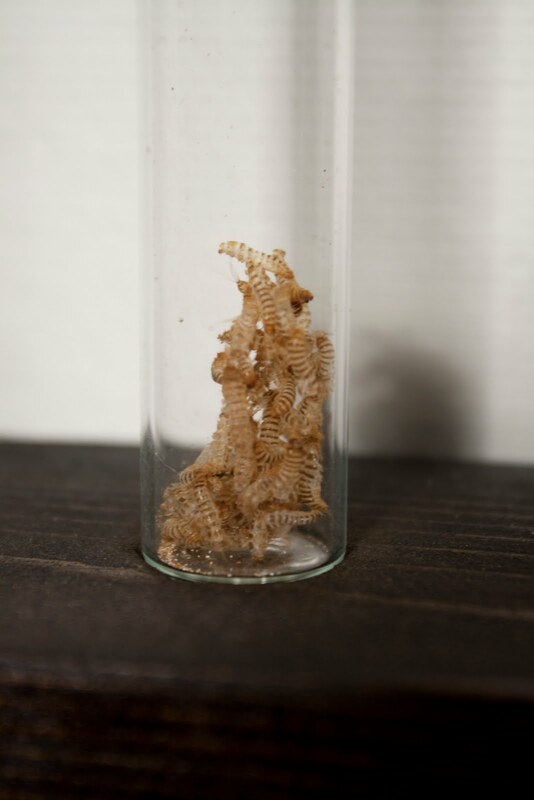 We had assumed dehydration was the cause of death, which it certainly could have contributed, but in December of 2007, upon reopening the box that I had stored his remains in, I discovered the dried husks of many dead mites (detail below) that had been parasitically inhabiting his shell. The bottle on the right contains sand and organic waste from the mites found in the box. The dried African violets date from around the same period, and were kept in the same box. The artichokes, which inhabit the centre of the composition and provide a kind of keystone for Reliq, were put to aesthetic use after their culinary use had expired. They were to be a meal for Anjali, sometime back in February 2010. 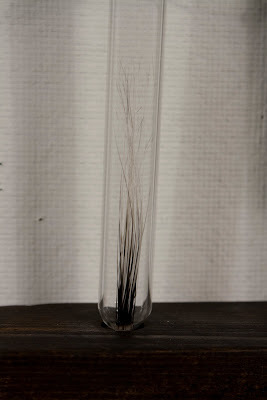 On the left are numerous whiskers (detail below) from Betty Gooch, the cat, collected over the course of our five year friendship. On the right is a tail feather from a Red-winged Blackbird collected in Yutan, Nebraska at some point in the middle 1990's. 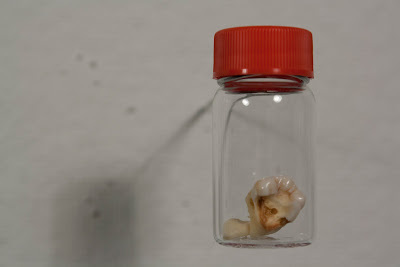 My own molar, number 19, extracted December 2007. It is in two pieces, as one of the roots broke off during the procedure. The wooden shelves were constructed by myself, at the end of April, 2010. 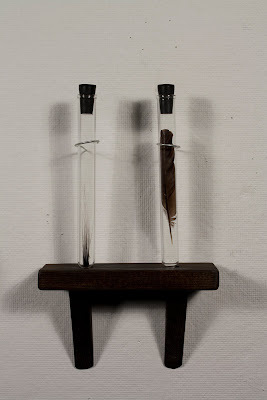 The test tubes, bottles, corks and rubber stoppers were purchased from American Science and Surplus. 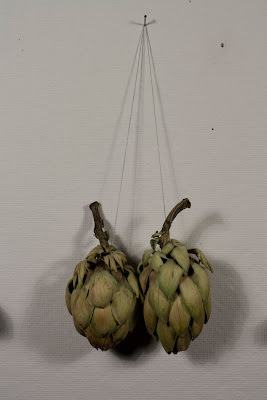 The wire hooks, used to anchor the bottles to the wall, were a bit of a last minute cobbling together. Sometimes you learn about your university's building hours the hard way. I have sturdier wire, needing of metal working tools, in my possession for future installation of Reliq. The primary research text for symbolic meanings was A Dictionary of Symbols by J. E. Cirlot. I have left out thorough discussion of the symbolism in this post, but the intrepid viewer may of course delve where necessary.